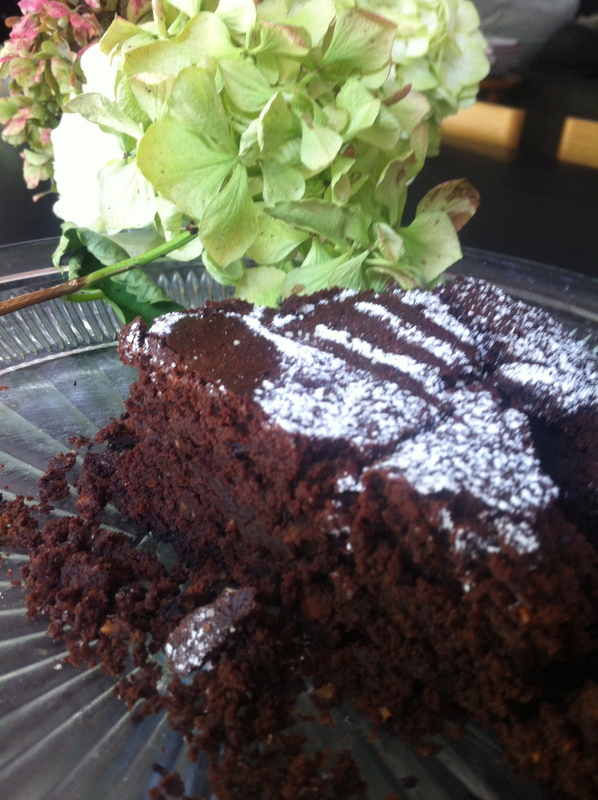 Feeling Uneasy and Chocolate Cake Comfort | Izzy have you eaten? It is without doubt a very strange time. That Flight MH 370 could make a couple of unusual manoeuvres, turn the plane around from its course, and then just DISAPPEAR, has been weighing heavily upon our family. 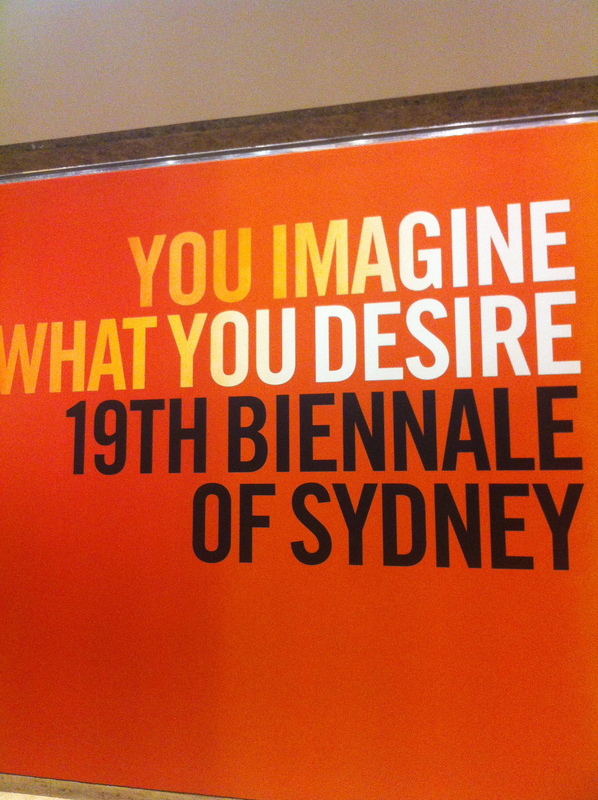 Meanwhile, we also watched helplessly while a group of artists slated to participate in the 19th Sydney Biennale, began to make so much protest about a sponsor, the Biennale’s well loved Chair had no choice but to resign. It threatened to leave arts agencies and galleries, (the very champions of such artists ) hamstrung and in jeopardy of losing state funding. Short sighted and acting on so little information, damaging years of goodwill. 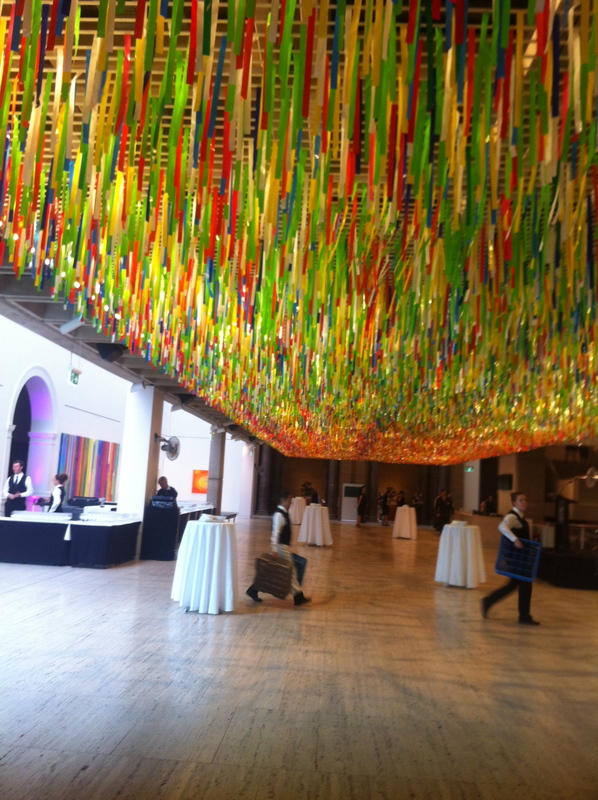 Preparations for the opening under Nike Savvas’ installation “Rally”. So much good art to see all over Sydney! Yes, we’ve had quite a few discussions about it all over long telephone calls and numerous texts. I know how upset you and Little C are Izzy, about the Malaysian plane. We’ve been on countless MH flights ever since you were born. I’ve thought hard about this unease; it has felt quite familiar. And then it struck me: it is the limbo our family was in, a quiet unease which later turned to helpless horror when news unfolded about 9/11. You girls were both at school on a clear sunny day in an idyllic American city not far from New York. I was at the gym with two school mums. We were on treadmills and watched astounded, on CNN as the first plane crashed into the Twin Towers. Then sickeningly, we watched live as the second plane crashed. I jumped off the treadmill, raced to the car and called dad. We wondered in panic what was happening. I stopped at a drive in-bank on Libby Avenue on the way home and shared this news with the teller; many people had not heard the news yet it seemed. She shut her window right after I left to find her manager. I could see we were heading in American terms to ‘lock down’. That early fall in Virginia was a surreal period. We watched the news round the clock. Your school was sometimes closed, based on the safety rating of the day. Low flying drones circled our city; it felt war-like and eery. The days were clear and bright, with a slight evening chill to remind us winter was on its way. It wasn’t easy explaining the situation to you dear little girls aged just 6 and 9. I felt like we were planets away from our simple life in New Farm where you went to the tiny school on the hill, Little C just a baby in a pram, and we lived amongst good friends. I just hope there is some end to the search for this plane. It is awful to think of the poor families waiting, waiting. 1. Preheat the oven to 180 degrees Celsius. Line the base and sides of a 20cm round cake tin with non-stick baking paper. 2. Make a “double-boiler” to melt the chocolate and butter: Bring a large saucepan of water to the boil. Place the chopped chocolate and butter into a heatproof bowl and place the bowl over the hot saucepan to allow the ingredients to melt. Stir occasionally. 3. Once all is melted, stir in the brown sugar, almond meal and almonds until the mixture is smooth. Allow to cool slightly, then add the egg yolks gradually, stirring each time. 4. Meanwhile, place the five egg whites into a clean dry bowl with a pinch of cream of tartar. 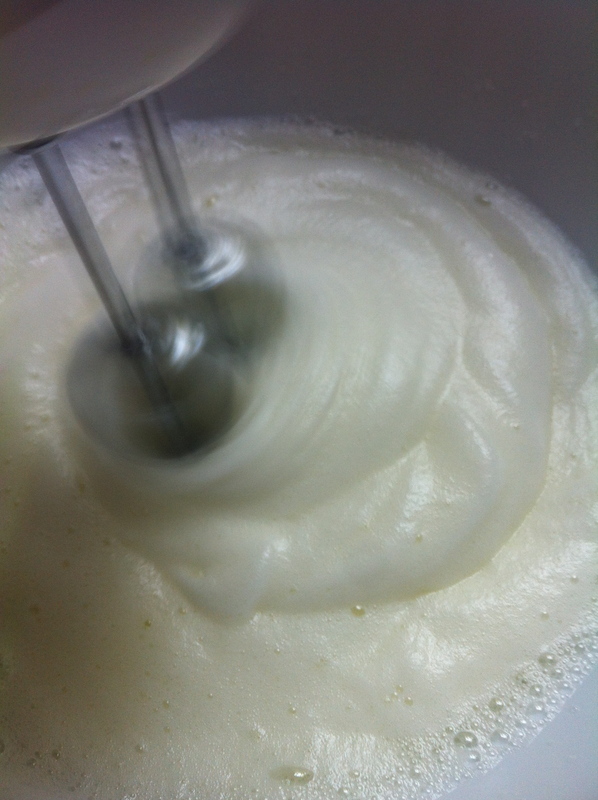 The egg whites will form the structure of the cake, so it’s important they’re well beaten. Using a hand whisk, electric beater or stand mixer, beat the eggs slowly at first until they are foamy and then gradually increase the speed every few minutes. (If you go straight to high speed, you increase the chance of your cake collapsing). Continue beating until firm peaks form. Don’t worry if you overbeat the eggs because you’ll beat some of the air out next. 5. 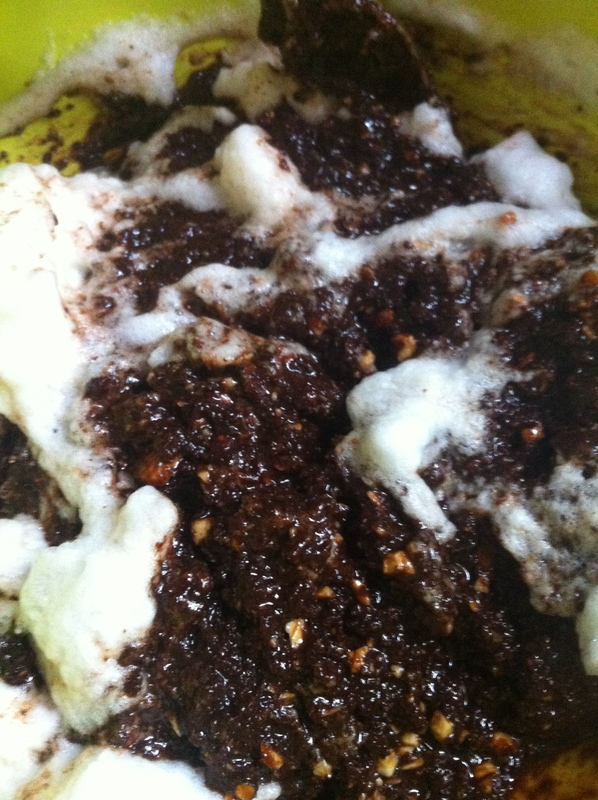 Gently fold the egg whites into the chocolate mixture. 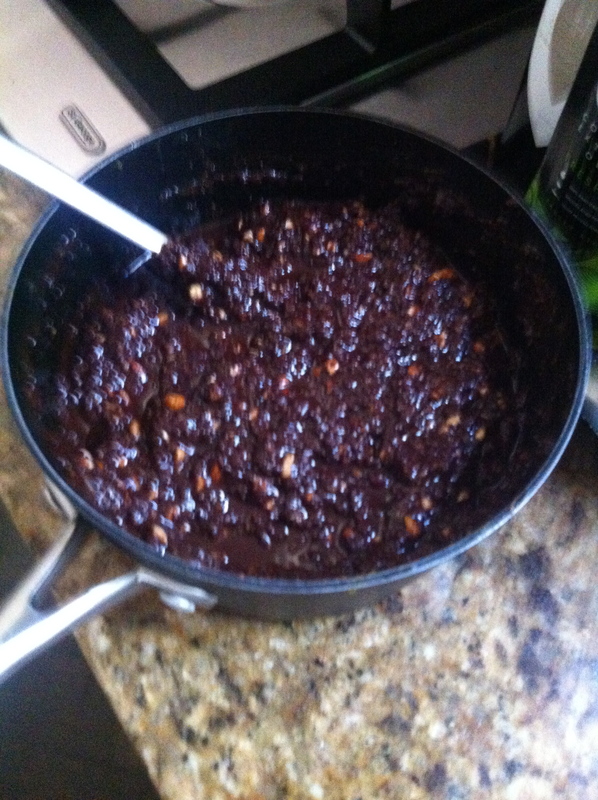 The chocolate mix is quite heavy, so don’t worry if you need to stir quite a bit at this stage. Stop when the eggs are just incorporated with the chocolate. 6. Pour the cake batter into the tin and bake for 45-50 minutes until a firm crust forms on the top. A skewer test is not necessary. Leave the cake to cool completely in the tin before attempting to remove. Once cool, sift cocoa powder over the top. 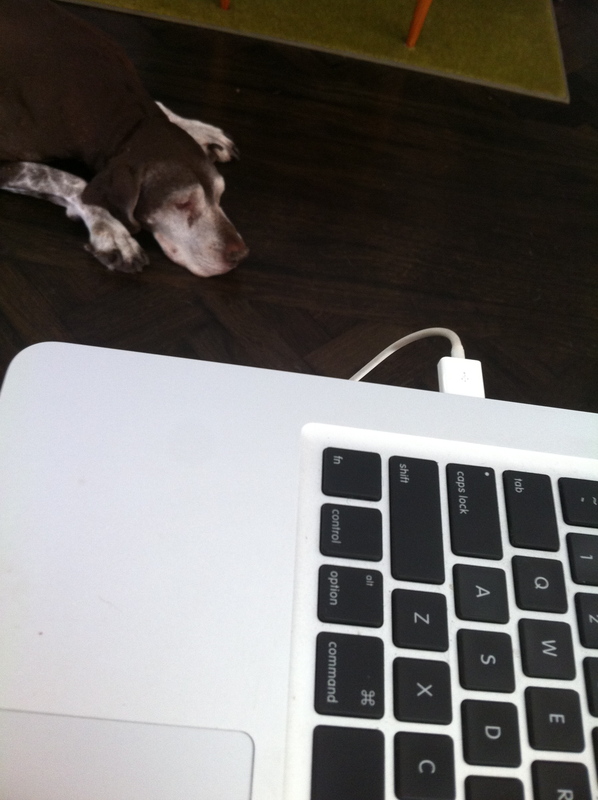 Also, you’ll be glad to know the doggie are keeping me good company. This entry was posted in Deserts, GROUP A, Uncategorized and tagged Chocolate Cake, deserts, Flourless, Gluten Free by tgb9593. Bookmark the permalink. Yes , in times of trouble ,keep cooking!! !Hope we might see you on Foundation private view Tuesday 25 March – Thinking of you and all those touched by Malaysian Airline mystery.